Zensar is hosting an Investor and Analyst Day in Mumbai on 28th November, 2018. The agenda for the day includes stimulating sessions with Sandeep Kishore, CEO & MD, and other key members of the management to provide information about our business and future prospects. The client is a leading provider of advanced location-based solutions including GPS, laser, optical and internal navigation systems. Over the course of time, the client expanded its customer and product base with number of acquisitions. It then attempted to integrate its positioning expertise in GPS, laser, optical and inertial technologies with application software, wireless communications, and services to provide complete commercial solutions. Post the merger, the client was not able to capture value and capitalize on potent synergies and struggled to merge the two distinct corporate cultures. Management lacked a clear view of the underlying operations and financials which handicapped their decision-making abilities. Customer dissatisfaction, operational inefficiency and post-merger resilience from the employees towards seamless cultural adaption was a grave issue at hand. There was a clear lack of detailed integration and communication plan to maximize value from the merger. We categorized our analysis into the broader heads of human capital, business processes and technology enablers. We captured the synergies in different areas including business operations, cultures and processes to identify major gaps and find effective ways to abridge them so that the combined entity delivered the desired output. We also unveiled erroneous reporting due to data and process duplication in the merged entity. We started by planning the course of action to achieve Target Operating model. Roles and responsibilities at different levels were defined for the merged entity which helped address the impending employee dissatisfaction due to their role change to a certain extent. A clear communication strategy was devised to help employees feel engaged and included in the decision making. Senior leadership were given guidance to help ingrain the new corporate culture in the organization. Combinational synergies were captured by defining the capability roadmap for different functions and processes which helped leverage the existing capability and best utilize the available systems in use. To help reduce lead time and make effective utilization of the human capital, process consolidation and automation roadmap was rolled out in collaboration with the operations team and senior managers. We identified transformational synergies and recommended areas where process automation can be leveraged to help reduce the lead time and utilize the human capital effectively. Analytics and smart reporting opportunities were recommended to enable faster and insightful decision making. This is how we harvested the best of two worlds into one. Our product strategy and design collaboration with AXA XL enabled them to conceive and launch an innovative global product in less than 3 months. Here are a few challenges we faced head on. How do you design a product which is a world first? How do you get a traditional organisation to act more like a start up? How do we move a team from a product-led mindset to end-to-end service thinking? To counter these, we organized a Product strategy workshop to identify what 'autonomous vehicle insurance service' would look like. We focussed distillation of key ideas into a market-ready product in 3-months and planned for a worldwide product launch and creation of an autonomy global centre of excellence. How do you invent the future? You design it. Autonomous vehicles are an exciting new technology which attract lots of media interest. What's had less attention are the implications for the insurance industry. What new or changed risks do autonomous vehicles represent, and how will the industry underwrite these? Whatever advances happen in the vehicles themselves, the sector can't move forward until insurance is available for them. AXA XL asked Foolproof collaborate on product strategy using design thinking. It was the first-time that AXA XL used this approach for new product development. Our client sponsor realised that if the product was conceived and specified without early participation by all the business areas needed to bring it to market then we would lose momentum and encounter blockages late in the process. She was tireless in persuading each business unit to field someone into the initial workshops who could speak for their area and collaborate on solutions. We brought together participants from all over the globe and from every part of the business that would have a hand in developing the product. AXA XL's autonomy partners, Oxbotica, also joined us to share what they had learned about technologies and marketplaces relating to vehicle autonomy. We started by looking at how other markets have been disrupted and how successful companies develop value propositions for today with an eye on building assets and capabilities for the future. In other words, who else has tackled a challenge like this? And what can we learn from their approach? By analysing the state of the market today, then understanding customer needs in the future, the group were able to develop a plan for how a service offering would develop as autonomy was adopted across different industries and commercial contexts. The team's strategy was for a service that will develop in three phases across a number of years as vehicle autonomy spreads across the world. The first phase was completed within three months when AXA XL unveiled its first insurance offering in this space in late 2018. As heritage companies find themselves competing with small agile organisations it's vital to find and embrace new approaches to stay relevant in a fast-paced world and get the right products to market quickly. By thinking of the problem in a different way and engaging a new approach to product design, AXA XL were able to produce a service offering from scratch and move to launch in under three months. Adrian Copland of AXA XL and Tim Loo of Foolproof shared the story and learnings of this project at the Festival of Marketing in London. Some noteworthy activities we carried out were stakeholder workshop, experience strategy, product strategy, strategic road mapping. Client is one of the leading food manufacturer in Europe with a mission to deliver great quality food to its group of customers. Despite many efforts to streamline its operations, client was struggling with working capital issues, productivity and cost efficiency. As a result, our we also discovered inefficiency in cash management process. our team of experts studied the client's industry and competitors to understand the market trends and benchmark cash conversion cycle, credit terms, cost structure and productivity against all its peers. End-to-end analysis of the finance function unveiled huge manual effort going into data entry, data correction and reporting. Multiple systems were in place which had different schematic representation of customer data. A common data schema which flows through multiple systems end-to-end was a major lack. Swivel chair processing was being done manually. Remittances posted by client's customers came through multiple channels and its tracking required manual effort. 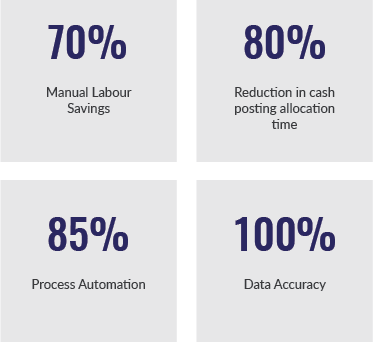 Cash management suffered as employees were occupied with data entry and corrections and had less time to track and report account receivables. As a result, alarming working capital management issues cropped up, resolving which was a challenge for the client. We identified the manual interventions and touch-points which qualify as potential automation opportunities and did feasibility analysis from costing and efficiency point of view. 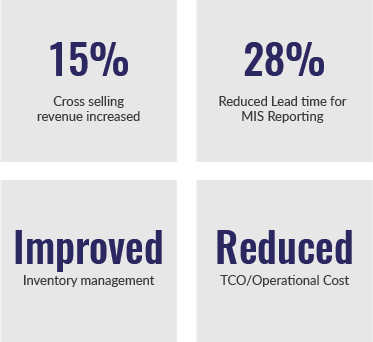 The entire automation exercise led to a lean and optimized reporting process which was data backed. Future automation opportunities could now be identified easily due to streamlined processes in place. New system now enhanced and provided a seamless user experience. Resources locked in redundant processes were freed to be utilized in other value-added activities. Grappled with the age-old working style, Human Resources function of this prestigious organization was poised to undergo HR transformation to make a comeback into the digital world as a modern and digital enterprise. Legacy system and processes in place HR function created competitive pressure to transform as it was cost inefficient and lacked contribution from the HR to fulfil its business goals. The client is an international organization that seeks to promote peaceful use of nuclear energy, and to inhibit its use for any military purpose, including nuclear weapons. We were approached by the client to help them modernise and devise a thriving HR strategy for them which would be in perfect alignment with their corporate objectives. The organization being a strategic government entity had a complex structure and some critical functions (e.g. Payroll, HRMS, Self-service etc.) were not in place. Many vital HR processes were time bound and had huge impacts downstream as they were carried out manually. Executing these processes involved redundant efforts as teams were working in silos and in disparate manner. 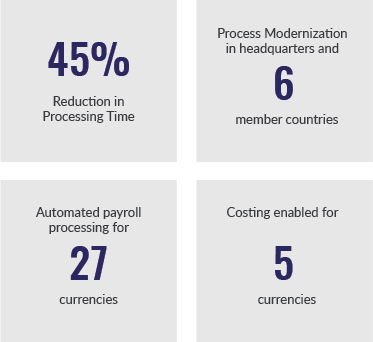 Manual adjustment for different currencies and processing with multiple countries was time consuming due to legacy systems in place which were high maintenance and time inefficient. Legacy systems and processes were high maintenance and time inefficient. Employees and managers were heavily dependent on the manual processes in HR and it created organization wide distress due to lack of transparency in the system, delayed responses and bottlenecks identification. Data consolidation within teams was vulnerable to human errors which increased rework efforts and delayed functions like 'Compensation and Pay'. Additionally, time and attendance tracking were done manually which created more challenges for the entire function. We carried out a 360-degree transformation of the HR function and sub-functions for the client. The complex organization structure and processes required a deep analysis around the roles, responsibilities and operations. This was a large-scale transformation that the client was undertaking and therefore having a clear vision and roadmap that tied back to the HR strategy and Corporate strategy at large was the implied imperative. We created functional workflows to better understand structure and processes in place which was instrumental in driving HR transformation roadmap. additionally, sub-functions including talent management, payroll, self-help portal, L&D etc. were analysed in isolation to identify automation opportunities. We employed our outside-in approach to map the user journeys, understand the touchpoints and enhance the user experience. This helped to identify where the self-service opportunities are to eliminate the dependency. Our expertise and tested methods helped client to navigate confidently through the transformation exercise. We believe that transformation is not a one-day process but an ongoing and evolving journey and thus we established a Center of HR Excellence to keep the momentum going and create internal change enablers.